Back to school is a busy time of the year. Families return from vacation only to have work and school on their minds. Dealing with traffic on the way to work, and on the way back from work to pick up your children from school can make you want to pull your hair out! Even commuting to and from college and work can be stressful, with the new school year in session. Because of this, going zero-waste may be the last thing on your mind. You might find your zero-waste habits slacking off, so here are some tips to help you continue your #PlasticFree efforts in September! Tip #1: Pack your lunch in a reusable lunch box, or bring an empty container with you. This applies to kids, college students, and even those heading back to work after a blissful summer vacation. Even if you don’t plan on meal prepping for the next day, bringing a lunch box you can reuse can reduce the need of a single-use styrofoam container if you end up buying lunch. Instead of using plastic containers or wrapping leftovers in napkins at work, you could toss those office snacks into a reusable box instead. Single use plastics and styrofoam containers creep into our daily lives more often than we realize! Another habit you can form is meal prepping. Meal prepping helps reduce waste by making sure you buy food you know you’ll eat before they expire. Always try to use up all the food you buy for the week, to reduce food waste. Sometimes buying bulk produce is not the best way to go – especially if you’re only cooking for yourself. Learn to meal prep has an obvious benefit, too: it reduces your stress in the mornings scrambling to pack a lunch before rushing to work or school. Homemade meals can be healthier than fast food, so meal prepping is good for both you, your wallet, and the environment! Tip #2: Pack a reusable spoon and fork or a set of chopsticks. How many times do you have office lunches that use a lot of plastic cutlery? Why not bring a set of forks and spoons from home (or chopsticks if you feel adventurous) for the occasional office lunch? You don’t need the fanciest set of reusable cutlery, just something that can help you say ‘no’ to plastic forks and spoons easily. Tip: toss a set of reusable forks and spoons in your work bag the night before, or keep a spare set in your bags so you’ll never forget them in the morning. Another thing you can do in offices is to supply reusable cutlery, or have enough on hand so that when the occasional lunch happens, your entire office can be plastic-free and zero-waste! Tip #3: Bring a reusable mug or a tumbler to work (or school). Any reusable mug can help you eliminate single-use coffee cups and plastic bottles. Say no to single-use styrofoam cups in the office kitchen! 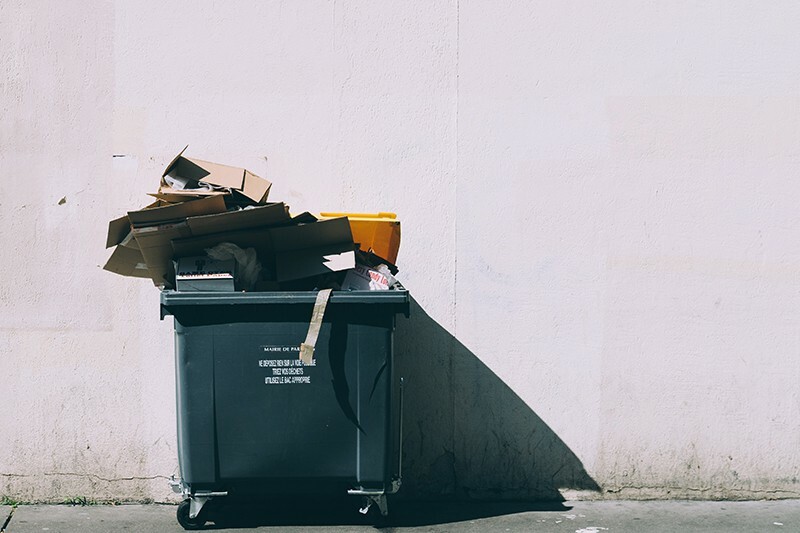 Sorting waste can be a hassle in shared spaces, like offices and schools. To avoid the hassle entirely, why not bring a reusable mug and avoid generating waste in the first place? Tip #4: Make it a group effort! As it becomes easier to live a zero waste lifestyle, why not get your friends, classmates, and colleagues involved in it too? It can be as simple as taking the initiative to speak with your child’s teacher, or putting in a suggestion for your office space to become zero-waste. There are costs associated with transitioning to a zero-waste office or classroom, but the environmental benefits will be priceless. Not to mention some actions you can take to transition are small steps. It can be as simple as having mugs for drinking water and coffee, instead of using plastic cups. It can be as simple as switching from using paper napkins to hand towels. It can be as simple as saying ‘no’ to plastic bags or cutlery when ordering take out. Every effort counts. Your coworkers might find your zero-waste efforts interesting too, strike a conversation, and join you in your zero-waste lifestyle. Or for parents, someone in your child’s class may find their zero waste and recycling diligence interesting and ask about it, learning good habits along the way. Tip #5: Make it count! Motivate yourself by counting how much money or time you save. Instead of having to replenish your stock of zip lock bags for your child’s lunch at the shopping mall during weekend rushes, switch to using a reusable lunch box saves you time and money. You’ll find yourself dropping by a store for ‘essentials’ less often, saving you time and fuel. Another way to make it count is to see how much you save by using a reusable mug or tumbler at local coffee shops. Some cafes in Vancouver and the Lower Mainland offer discounts on coffee if you BYOM. The nickles and dimes add up and soon you’ll be amazed at not only the extra change in your wallet — but also the change you’re making for the environment. What are some of your back-to-school zero waste tips? Share it with us on social media, and tag us at @cdnmattrecycler on Twitter or @canadianmattressrecycling on Facebook! Canadian Mattress Recycling Inc., is the premier facility for mattress and furniture recycling in the Lower Mainland. Based out of Annacis Island, we pick up old mattresses and furniture across Vancouver and the Lower Mainland. Since 2011, we have recycled over 21,000,000 lbs of mattresses and furniture and supported over 90+ organizations and charities involved in environmental preservation and the community.